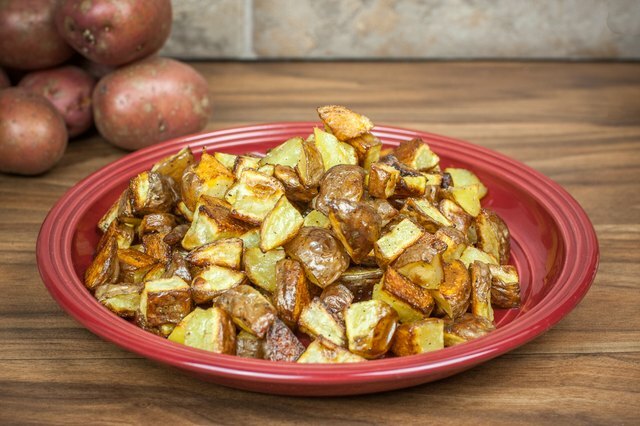 Red potatoes work especially well for roasting because they have less starch and more moisture than some other potato varieties, giving you the crusty, golden exteriors and the soft, creamy interiors that make the best roasted potatoes. 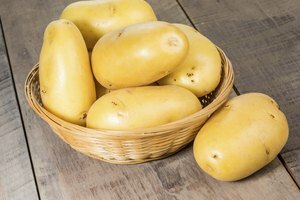 The most common variety of potato in the U.S., according to the Produce for Better Health Foundation, red potatoes all have red skins and either white, yellow or red flesh. 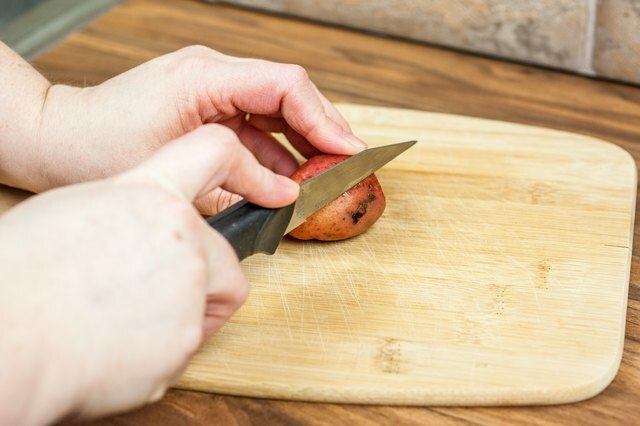 Because red potatoes have thin skins, they don't need peeling before roasting; simply wash them in running water, scrubbing them gently to remove any dirt, and remove any bruised spots and eyes with a paring knife or vegetable peeler. Cut larger reds in halves or quarters before roasting and keep small varieties whole. 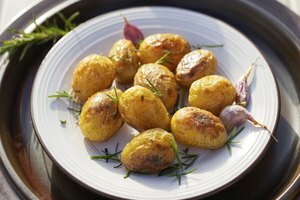 If you need to prepare the potatoes ahead of roasting, either toss them with a tablespoon of lemon juice or place them in a bowl of water, then refrigerate them for a few hours or overnight. Tossing cut or small, whole potatoes in vegetable oil before cooking helps the exteriors turn crisp and browned, and keeps the spuds from sticking to the pan -- use about 1 tablespoon of oil per pound of potatoes. 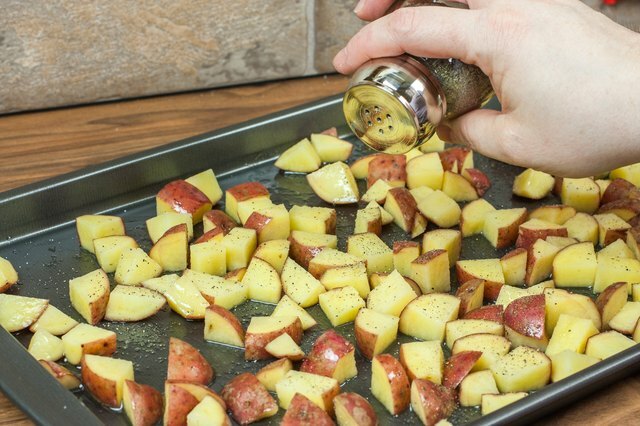 A sprinkling of salt and pepper suffice for delicious potatoes, but you can also increase the flavor with dried herbs added before cooking or fresh herbs added after for a dash of bitterness to balance the creamy potatoes -- try thyme, rosemary, oregano or chives. For extra zing, add minced garlic or chili oil before roasting. 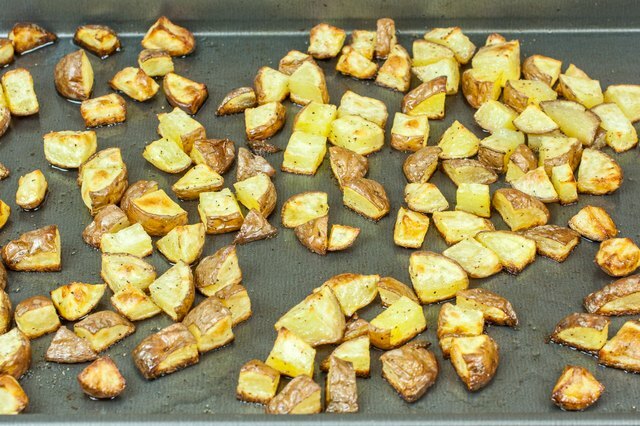 Spread the potatoes in a single layer in a roasting pan or on a baking sheet, and place them in a preheated oven set at 400 degrees Fahrenheit. 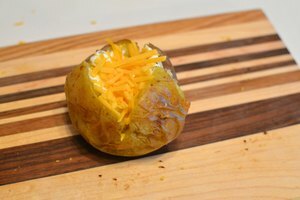 If your oven tends to run on the cooler side, increase the temperature to 425 F. Because red potatoes are small, they'll take from 30 to 45 minutes to cook. Remove the pan from the oven after 20 minutes to turn the potatoes. You'll know they're done when the exteriors are golden and you can easily insert a knife or skewer into the interiors. 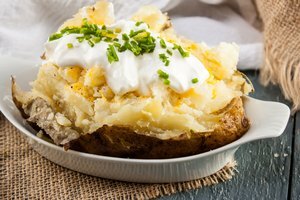 Toaster ovens and convection ovens can be used to roast potatoes, but don't opt for countertop roasters, microwaves and slow cookers because the potatoes won't brown and won't have the crunchy exterior that you expect. For either a convection oven or a toaster oven with a convection feature, experiment with two options: Cook the potatoes at 400 F, but check them after 13 minutes for done-ness; or cook them at about 375 F for the normal time. 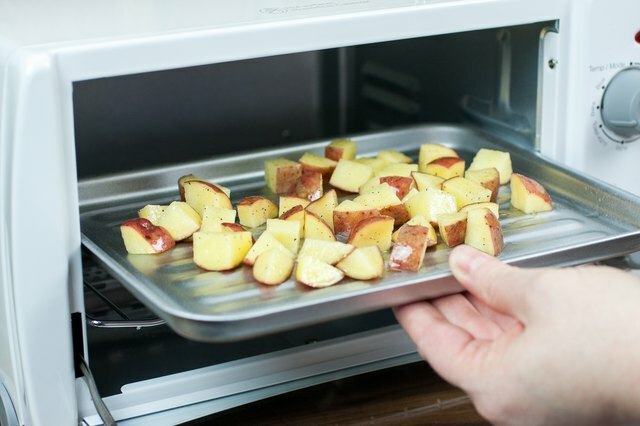 Red potatoes cook in a regular toaster oven at the same temperature as in a regular oven, but will take slightly less time, so watch them carefully. 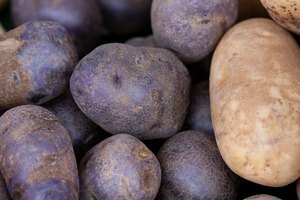 Fruits and Veggies More Matters: Red Potatoes -- Nutrition. Selection. Storage. Idaho Potato Commission: My Potatoes Turned Black, Are They Okay to Eat?